LADY READE'S 'CABINET OF CURIOSITIES'. 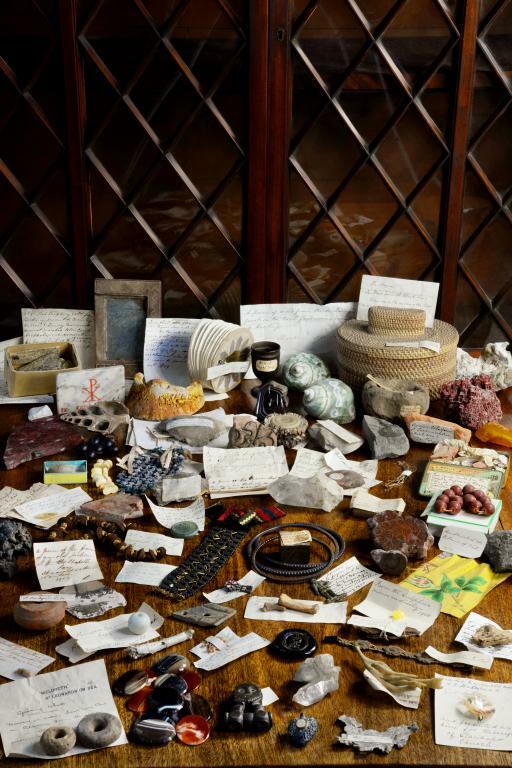 THE ANTIQUITIES, RELICS, ARCHEOLOGICAL OBJECTS, CURIOS AND MINERALS COLLECTED BY LADY READE FOR HER CABINET AT CARREGLWYD IN THE 19TH C including objects found on or near her Anglesey estate and many retaining her handwritten label, including The occiput probably of a Lord Mayor or Alderman from foundations of St Paul's [Cathedral] Piece of [medieval] tile dug up at Cef... farm in Llanfairynghornwy parish about 1812 Several fragments of wood from the wreck of the "Royal Charlotte" Roman lamp found at Boulogne-sur-MerPiece of wood from one of the sunken ships in Sebastopol Harbour [carved as a book]An Indian idolTwo glass wine bottle seals, one inscribed I Conway 1726Celt found at Llanfair PG, 1866' Princess Bronwen's bead' dug up on the Alaw river bank, 1811 A bracelet taken from a house in Sebastopol which had been evacuated that day, 1856 Looking glass taken from the Palace of King Coffee at Coomassie [in the Ashantee War] 1873 [sic]A [Chinese] necklace of carved cherry stonesDiminuative stone cup found at Llanfaethlu Anglesey supposed of early British period by Miss Conway-Griffith Bag from the Mauritius, 1856Part of an Egyptian mummyThe tooth of the King of Portum... who made a pilgrimage to Rome in the Third Century. Presented to me by Mr Donovan. The tooth dropped out of the skull in his presenceNecklace of Rosso Moderno marble beadsTwenty oval specimens of polished agate (100 approx)Provenance: Miss Maria Emma Elizabeth Conway-Griffith (1840-1911), who married on 11 March 1880 Sir Chandos Stanhope Hoskyns Reade, 8th Bt.